Hardy Mixed Carnations | Henry Field's Seed & Nursery Co.
A wonderfully fragrant and long-lasting choice for cutting! The frilly blossoms fill the air with a sweet spicy scent from late spring to early summer, perched atop sturdy foot-high stems. Very adaptable and easy to grow, best planted in full sun to partial shade. Bareroot. 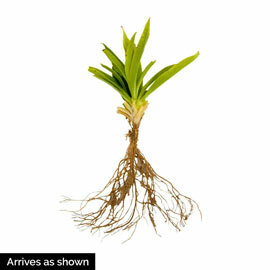 Depth: Plant with crown 1 inch below soil lsurface. Color: Our choice of colors. Red, pink, white or yellow. Foliage: Long narrow, needle-like, grey-green, evergreen in warmer climates. 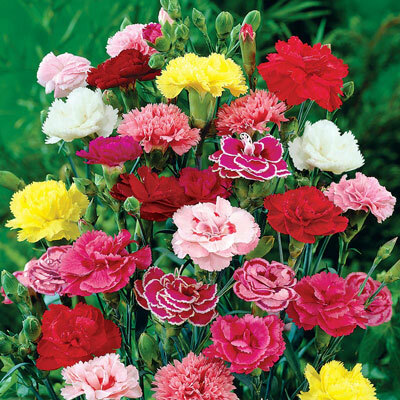 Blooms: Late Spring to early Summer for several weeks. Flower Form: Plump, fully double flowers. Soil Requirements: Well-drained, moist soil that is slightly alkaline. Pruning: Remove spent flowers to encourage rebloom. Size: Flowers are approximately 1.5 inches wide.